We interrupt this narrative to report on last weekend's three-day cruise to Two Harbors at the Isthmus on Catalina Island. It is the first cruise since a lengthy project to refinish the boat from the gunwales in -- the deck, cabin exterior and cockpit. All the how-to details will come later. From Long Beach it is typically a motor-sail part way to the Isthmus, especially leaving in the morning. If the usual southwesterly to westerly afternoon winds prevail, you need to get well west of Pt. Fermin to set a close-hauled sailing course to Two Harbors. Of course, the typical winds may not prevail, or at least not develop in time. That was the case last Friday. 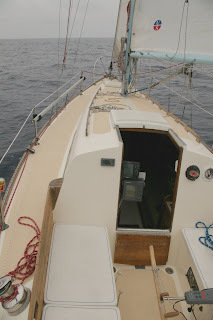 After motoring through the Long Beach Inner Harbor to Queens Gate, and then direct to the San Pedro buoy in light morning southeasterlies, I found myself with calm winds and glassy seas south of the buoy. In fact the wind didn't come up until about 2 p.m., about three miles out from the moorings at Two Harbors. And it was directly on the nose. So what. Narrow Escape motor sails at an easy 5.7-6.0 knot range leaving me plenty of time to enjoy the scenery and daydream. Arriving at the harbor, the moorings east of the pier were virtually empty, while those to the west were only sparsely filled. Had everyone made the trip for Memorial Day weekend and didn't want to return? Were there fears of lingering effects from the Catalina Island wildfire three weeks earlier? Was the cool overcast of June Gloom, responsible? Who knows. I arrived at the Harbor Patrol boat just ahead of my friend Nate in a Catalina 30, and we ended up with side-by-side moorings. The most difficult part of single-handed sailing is picking up a mooring. Steer for the pickup wand, modulate your speed, take the engine out of gear so the boat will coast to a stop just as it reaches the wand. Then run to the front of the boat with the boat hook when you're sure that it is all going to work out. With my friend watching and waiting for his run at the adjacent mooring, I got to do this little drill three times before I succeeded. Thankfully there were few other boats around to worry about hitting. Too much working and not enough sailing lately. With two crew aboard to help, Nate did it perfectly and quietly in one pass, the way a skilled skipper should. The cruise last weekend was to join fellow members of one of my clubs, Little Ships Fleet Yacht Club on its Spring Cruise. Highlight of the event was a beach barbecue Saturday night at Two Harbors, which drew about 50 people from aboard about 15 boats. They included the crews of five boats chartered from Marina Sailing, which raced each other to Ship Rock on Saturday and back to Long Beach on Sunday. The return sail on Sunday really was a sail. I didn't leave until 1:30 that afternoon. The wind was already blowing about 8-10 kts. and it kept blowing even after I got away from the island's influence. Too often it will start blowing at the island in late morning and then die to nothing within 2-3 miles of shore. In fact, that morning I had watched the Marina Sailing boats drifting on glassy seas out by Ship Rock as they attempted to start their race home at noon. No drifting for me however. As soon as I got the sails up I was doing 5 kts. on a broad reach with a course of 035 degrees. By the time I was within 10 miles of my destination, there were small whitecaps and 1-2 ft. of wind chop on top of 1-2 ft. seas. My knot meter was bouncing between 6 and 6.5 knots. There was no sun, however. The sky was gloomy and hazy with a low ceiling all the way across. The sailing was great. The Ericson 30 was offered for sale. But the seller didn’t have the pink slip. In fact, he did not own the boat. He leased it. The boat had been donated a year earlier to the Pacific Coast Sailing Foundation in Long Beach. The Foundation operates the United States Sailing Center, which is partly financed through the sale of donation boats. The Foundation “sold” him the boat in a two-year lease with purchase option deal for $7,500, plus an additional $250 fee. He paid most of the money up front as payment for a 23-month lease. The balance was due in the 24th month (July 2006) to exercise the purchase option. Otherwise the boat would revert back to the Foundation, which held the title. The seller was taking a $2,000 loss, not counting the cost of the new outboard, a new inflatable dinghy, the so-far unsuccessful repairs to the inboard and any other money he had put into it. The deal being offered was to give the seller $4,000 cash and agree to pay the $1,500 balance due to the Foundation the following summer to gain title. The seller said the Foundation had agreed to transfer the lease-purchase agreement to his buyer. It made me a little nervous, yet it seemed simple enough and it should be easy to verify that the transfer would happen before I paid off the seller. Being an experienced boat buyer and boat owner, I knew the steps to take. Put the terms of purchase in writing and make sure the details are clearly understood by seller and buyer, especially the details about how the purchase can be aborted and the deposit refunded if the boat doesn't measure up. If you buy a boat from a reputable broker, the sales person will walk you through these steps. It's a little different buying from an individual. However, after spending several hours together on the boat at the dock and then going to the seller's house to view more paperwork and write up the deal, it was clear that I was dealing with a honorable person and I felt quite comfortable making an agreement with him. There are two major turning points in a boat purchase. The first is the "sea trial" and the second is the "survey". The sea trial is a chance to make sure that everything works as claimed and that the boat performs as it should. A buyer can decline the purchase if the boat doesn't meet expectations. The seller foots the bill for the sea trial, which should only be the cost of fuel involved. On a sailboat that should be trivial. The buyer pays the costs of going forward with the next step in the purchase. The boat should be surveyed (inspected) by a professionally-accredited marine surveyor specializing in that type of vessel. For sailboats like the Ericson 30, the typical price in the fall of 2005 was $15 per foot. Generally such a survey does not address engine condition. For that a separate engine survey, usually by another expert, is required. In my case, I knew the engine didn't work and I thought I knew enough about engines to fix it, so I didn't bother with an engine survey. The boat needs to be hauled out of the water for a proper survey to be made, which means taking it to a boat yard and paying the requiste fee. The assumption is that the boat will need new bottom paint and most yards will offer to absorb the haul-out charges if the new buyer hires the yard to refinish the bottom once the survey is finished. Of course, it knows that there likely also will be a series of repairs made to fix what the surveyor finds wrong with the boat. The costs of those repairs, especially serious and unexpected repairs, are often the subject of last-minute price negotiations between buyer and seller. At a minimum, if the boat turns out to be a poor investment in the eyes of the surveyor, the buyer can walk away, but will still have to pay the haul-out charges and the surveyor's fee. A neophyte buying an old boat could end up paying out significant money with nothing to show for it. Chalk it up to education. It's a lot cheaper to surf the internet and learn as much as possible about boats before walking the docks looking at "For Sale" signs.